SUBJECT : Prescribing the Implementing Guidelines on the Revised Tax Rates on Alcohol and Tobacco Products Pursuant to the Provisions of Republic Act No. 10351 and to Clarify Certain Provisions of Existing Revenue Regulations. SECTION 1. Scope. – Pursuant to the provisions of Section 244 in relation to Section 245 of the National Internal Revenue Code (NIRC) of 1997, as amended, these Regulations are hereby promulgated to implement the provisions of Republic Act No. 10351, “An Act Restructuring The Excise Tax On Alcohol And Tobacco Products By Amending Sections 141, 142, 143, 144, 145, 8, 131 And 288 of Republic Act No. 8424, Otherwise Known As The National Internal Revenue Code Of 1997, as amended By Republic Act No. 9334, And For Other Purposes”, as well as to clarify certain provisions of existing revenue regulations on alcohol and tobacco products. (h) SUGGESTED NET RETAIL PRICE – shall refer to the net retail price at which locally manufactured or imported alcohol or tobacco product is intended to be sold by the manufacturer or importer at retail in major supermarkets or retail outlets in the prescribed minimum number of Revenue Regions for brands with national or regional markets. SEC. 4. TAX CLASSIFICATION OF ALCOHOL AND TOBACCO PRODUCTS. – Any alcohol or tobacco product that is introduced in the domestic market on or after the effectivity of this Act shall be initially tax classified according to their suggested net retail prices as declared in the prescribed manufacturer’s or importer’s sworn statement, subject to the initial validation and revalidation requirements prescribed under Revenue Regulations No. 3-2006, as amended by Section 6 of these Regulations. In case of an alcohol and or tobacco product that was duly registered with the BIR before the effectivity of the Act but was not tax classified by the BIR according to the new tax rates provided under the Act, such product shall be treated as a newly introduced product upon re-introduction thereof in the domestic market after the effectivity of the Act. Accordingly, the tax classification thereof shall be based on the suggested net retail price declared in the aforesaid sworn statement, subject to the initial validation and revalidation requirements. The proper tax classification of all fermented liquors and tobacco products, whether registered before or after the effectivity of the Act, shall be determined every two (2) years from the date of effectivity of the Act. SEC. 5. DOWNWARD RECLASSIFICATION OF FERMENTED LIQUORS. – Any downward reclassification of any fermented liquor product that is duly registered with the BIR at the time of effectivity of the Act which will reduce the tax imposed herein, or the payment thereof, shall be prohibited. Starting January 1, 2014, the applicable tax rate shall be increase by four percent (4%) annually: Provided, however, it shall not be lower than the rates prescribed under Section 3 of these Regulations. (i) Corresponding excise and value-added taxes per case. The manufacturer’s or importer’s sworn statement shall be submitted as a supporting document to the prescribed application for the initial registration of alcohol or tobacco product and thereafter submit an updated sworn statement on or before the end of the months of June and December of the year: Provided, however, That whenever there is a change in the cost to manufacture, produce and sell the brand or change in the actual selling price of the brand, the updated sworn statement shall be submitted at least five (5) days before the actual removal of the product from the place of production or release from the customs’ custody, as the case may be: Provided, further, That if the manufacturer or importer sells or allows such goods to be sold at wholesale in another establishment of which he is the owner or the profits thereof of which he has an interest, the selling price in such establishment shall constitute the wholesale price.should such price be less than the said costs and expenses, a proportionate margin of profit of not less than ten percent (10%) thereof shall be added to constitute the wholesale price. With respect to imported alcohol or tobacco products, the cost of importation shall, in no case, be less than the value indicated in the reference books or any other reference materials used by the BOC in determining the proper valuation of the imported products, or the dutiable value as defined under the Tariff and Customs Code of the Philippines, as amended, whichever, is higher: Provided, finally, That, in case the newly introduced alcohol or tobacco product shall be subsequently marketed in another region/other regions before the proper tax classification is finally determined by the BIR, an updated sworn statement shall be submitted to the appropriate BIR Office before the same shall be removed from the place of production. The sworn statement prescribed herein shall be subject to verification by the BIR to validate its contents with respect to its accuracy and completeness. In the event that the contents thereof are found to be inaccurate and/or incomplete, the taxpayer shall be required to submit a revised sworn statement, without prejudice to the imposition of corresponding sanctions and penalties. SEC. 8. UNDERSTATEMENT OF SUGGESTED NET RETAIL PRICE. – The understatement of the suggested net retail price by as much as fifteen percent (15%) of the actual net retail price shall render the manufacturer or importer liable for additional excise tax equivalent to the tax due and difference between the understated suggested net retail price and the actual net retail price. No. 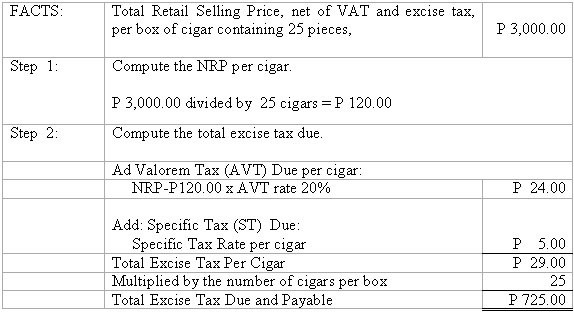 4 – CPI Corp., a cigarette manufacturer, submitted a sworn statement of a cigarette product, “Mirage”, wherein the tax rate to be imposed is P12.00 per pack based on the Suggested Net Retail Price (SNRP), excluding vat and excise, of P 9.50 per pack. 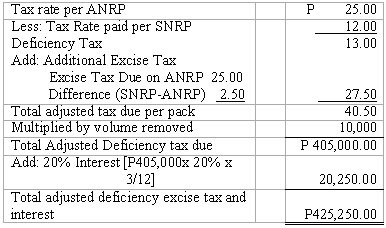 After three months from the date of submission of the sworn statement, the BIR conducted a price survey and found out that the Actual Net Retail Price (ANRP), excluding vat and excise tax is actually P 12.00 subject to the higher excise tax rate of P 25.00 per pack. The total volume removed by CPI Corp. on the product is 10,000 packs from the time of its removal up to the time of the price survey. Compute the total deficiency excise tax and penalties of CPI Corp., if there are any. Since the understatement of 26.32% is more than 15%, CPI Corp is, therefore, liable to the additional penalty for understatement of suggested net retail price. Step 4. Compute the total amount due from CPI Corp.
SEC. 9. EXCISE TAX TREATMENT OF ALL IMPORTATIONS OF ALCOHOL OR TOBACCO PRODUCTS BY DUTY FREE PHILIPPINES, DUTY-FREE SHOPS, OR INTO ECONOMIC ZONES AND FREEPORT ZONES. – The provision of any special or general law to the contrary notwithstanding, the importation of alcohol or tobacco products, even if destined for tax and duty-free shops, Duty Free Philippines or into the chartered or legislated economic and/or freeport zones shall be subject to excise tax pursuant to the provisions of the Act. : Provided, however, That, upon the effectivity of the Act, the importation of any alcohol or tobacco product bearing suffixes or prefixes to the root name, color and/or design of the label (such as logo, font, picturegram, and the like), manner and/or form of packaging or size of container of the product that is different from that already registered and locally being sold in the domestic market shall be treated as a newly introduced product. Accordingly, the same shall be initially classified according to its suggested net retail price, subject to the validation and revalidation requirements prescribed by these Regulations. SEC. 10. Additional export and import requirements for tobacco products. – No tobacco products manufactured in the Philippines and produced for export shall be removed from their place of manufacture or exported without posting of an export bond equivalent to the amount of the excise tax due thereon if sold domestically; provided, however, that tobacco products for export may be transferred from the place of manufacture to a bonded facility, upon posting of a transfer bond, prior to export. Tobacco products imported into the Philippines and destined for foreign countries shall not be allowed entry without posting a bond equivalent to the amount of customs duty, excise and value-added taxes due thereon if sold domestically. SEC. 11. REVISED PROVISIONS FOR THE MANNER OF PACKAGING OF CIGARETTES. – AllCigarettes whether packed by hand or packed by machine shall only be packed in twenties (20s), and through other packaging combinations which shall result to not more than twenty sticks of cigarettes: Provided, That, in case of cigarettes packed in not more than twenty sticks, whether in 5 sticks, 10 sticks and other packaging combinations below 20 sticks, the net retail price of each individual package of 5s, 10s, etc. shall be the basis of imposing the tax rate prescribed under the Act. 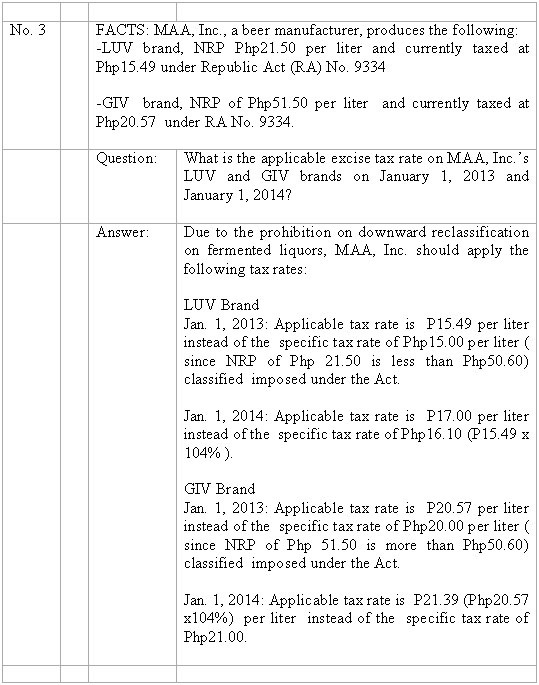 (a) All alcohol and tobacco products existing in the market at the time of the effectivity of this Act shall be initially classified according to the tax rates prescribed by the Act based on the 2010 price survey of these products conducted by the Bureau of Internal Revenue (BIR), subject to the prohibition against downward reclassification on fermented liquors: Provided, however, That in case of alcohol and or tobacco products that were introduced after the 2010 price survey but before the effectivity of the Act, their respective tax classification or rate shall be based on the suggested net retail price declared in latest sworn statement filed by the local manufacturer or importer, as the case maybe. The Commissioner of Internal Revenue shall issue a Revenue Memorandum Circular containing the tax classifications/rates applicable to all alcohol and tobacco products existing in the market at the time of the effectivity of the Act. (b) For purposes of determining the actual volume of locally manufactured alcohol and tobacco products that shall be imposed with the new tax rates upon the removal thereof from the place of production, an actual stocktaking shall be conducted by the BIR on all stocks of locally manufactured alcohol and tobacco products held in possession by the manufacturer as of the effectivity of the Act. 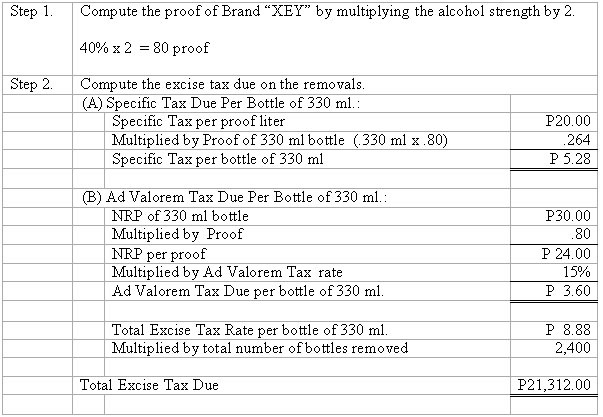 (c) The specific tax that was paid on the physical inventory of ethyl alcohol held in possession by manufacturers of compounded liquors as of the effectivity of the Act subsequently used as raw materials in the production of compounded liquors shall not be entitled to tax credit/refund or shall not be deducted from the total excise tax due on compounded liquors. SEC. 13. Penalties. – Violations of these Regulations shall be subject to the corresponding penalties under Title X of the NIRC of 1997, as amended. (d) If the offender is not a citizen of the Philippines, he shall be deported immediately after serving the sentence, without further proceedings for deportation. SEC. 14. SEPARABILITY CLAUSE – If any of the provisions of these Regulations is declared invalid by a competent court, the remainder of these Regulations or any provision not affected by such declaration of invalidity shall remain in force and effect. SEC. 15. Repealing Clause. – All regulations, rulings, orders, or portions thereof which are inconsistent with the provisions of these Regulations are hereby revoked, repealed or amended, accordingly. SEC. 16. Effectivity. – These Regulations shall take effect upon its publication in leading newspapers of general circulation. This entry was posted under Departmental Issuances and tagged Department of Finance, departmental issuances. Bookmark the permalink.